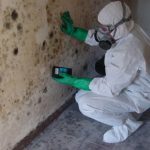 Virginia Department of Health > Environmental Epidemiology > Hot Topics > Uncategorized > Who Do I Contact For Help With Mold Removal? Who Do I Contact For Help With Mold Removal? If you live in an apartment and you feel that your landlord/property manager has not promptly addressed your concerns, please contact the Virginia Office of the Attorney General’s Consumer Protection Section. The Office of Consumer Protection provides information to individuals on matters related to landlord-tenant issues, and can be reached at either 804-786-2042 or 1-800-552-9963. Additionally, the Virginia Residential Landlord and Tenant Act (Sections 55-248.2 through 55-248.40 of the Code of Virginia) establishes the rights and obligations of residential landlords and tenants in the Commonwealth, but only the courts can enforce those rights and obligations. To review the Act, please click on Virginia Residential Landlord & Tenant Act. If you own a residential home, it is recommended to contact a mold assessment, remediation, or removal company that holds a certification from the American Industrial Hygiene Association. The Virginia Department of Health (VDH) does not assess the credentials of, or make recommendations regarding, specific mold specialists. NOTE: VDH does not have the capability to provide environmental testing or remediation for mold problems. Concerned citizens are advised to follow the practical advice given on this site, refer to additional resources, and if necessary, consult an environmental specialist.